Just popping in to tell you about a New Craftsy Class:: Fabulous Bows & Fashion Details! I get asked lots of cake decorating questions all the time, and bows are one of the most popular subject! I know how to make a few (see my poofy bow tutorial here) but I desperately wanted to sign up for this class in real-life at Cake Fest and learn about these bows. Sadly, it sold out super fast and I missed out!! At that time, I had no idea that Eva Salazar had a Craftsy class in the works with the exact same subject matter! Yesterday I nearly bounced off the couch I was so excited to see this in my inbox! It is next in my long list of Craftsy Classes I own! PS – although I didn’t get into this Fabulous Bows class at Cake Fest, I did manage to get into Shawna’s class and I’m probably going to make a complete fool of myself that day when I meet her!! 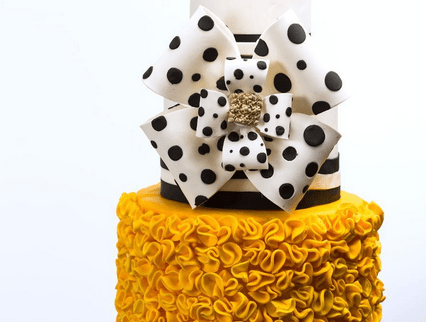 Create your most stylish cakes alongside fashion-forward decorator Eva Salazar. Learn how to texture your designs with eye-catching ombré ruffles and luscious scrunched ruffles. Create designs abloom all over with vibrant fondant flowers. Add designer decadence to your work with pillowy, polka-dotted fondant billows and delicate wafer-paper variations. Next, master the art of the gum paste bow: Create basic yet beautiful two-loop bows with graphic stripes, flowing tails and a shimmering brooch. Add dramatic dazzle to your portfolio with four- and eight-loop bows. 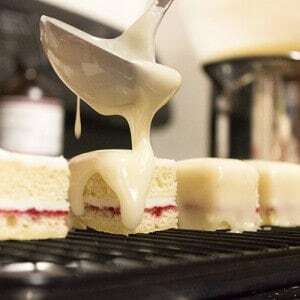 Plus, learn how to make a fondant bow with a long, rippling tail — a breathtaking accent for extra-tall tiers. 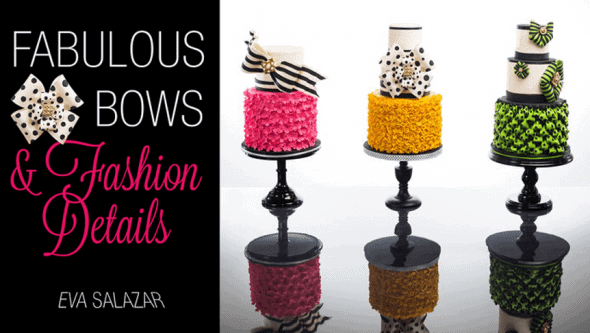 Top sumptuous textures with runway-inspired bows for cakes that always steal the show! This class includes 7 HD lessons (totaling near 3 hours) with anytime, anywhere access!! And the bows… oh the bows…. It’s just perfect, isn’t it? I’m in awe! • Learn for life! With lifetime access to your classes, you can watch lessons at your preferred pace and easily revisit your favorite concepts with just a click. • Kick up your feet! Enjoy classes anytime from the convenience of your home or even on-the-go with our mobile apps. • Get personalized guidance! Ask your expert instructor and fellow students questions to receive all the answers and feedback you need to succeed. • Conquer new concepts! Learn easily with helpful diagrams, engaging graphics and downloadable materials that walk you step-by-step through gaining skills. If you’re ready to take a class, hurry and grab it now while it’s on sale for 33% off! But if you’re still not sure, please sign up for a free class and get a feel for Craftsy! I’m sure you won’t be disappointed! Thank you so much for your fantastic Craftsy Class review!!! hope to see you at Cake Fest! !